It was a modest week in guerilla gardening, some weeks ago. 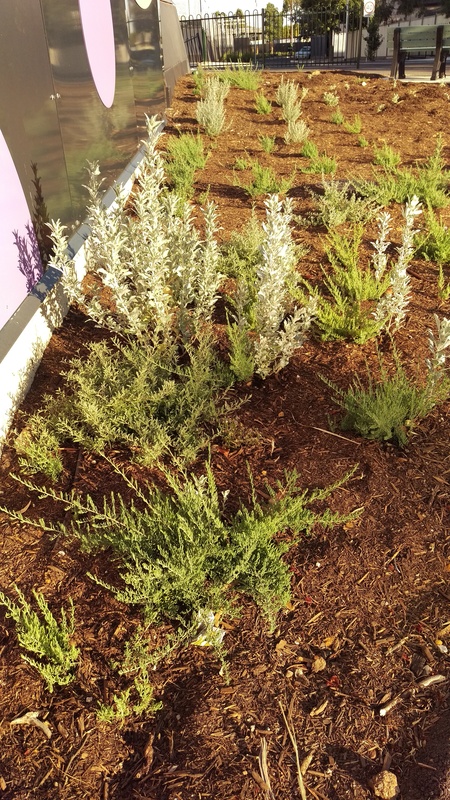 Action on one of my patches that was barren for years and then suddenly mulched and given a watering system seems to have stopped. So I decided it might be safe to do some more planting. Bladder saltbush, which has a lovely silver leaf, was the plant of choice, and I decided to try another creeping boobialla. All those previously planted here were lost in the mulching. They look small in this big space right now. However, the weather is warm and this is growing season. Some of the plants I put in during the cooler months are now a lot larger. Someone else seems to have planted a few things in this patch too! This is all I took home. 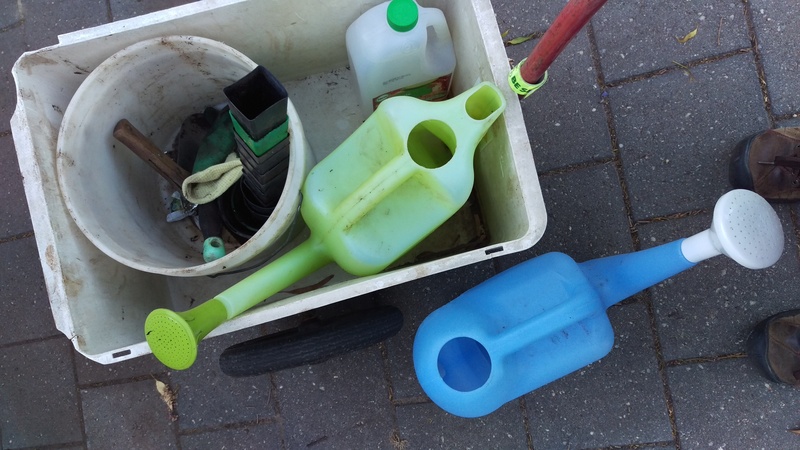 Then–a weekend planting spree after a long break. We have already had out first day over 40C and there are more coming. These little plants need to get into the ground. So, there was pricking out of nitraria billardiera and dianella seedlings. I gathered up ‘old man’ saltbush, creeping boobialla, seaberry saltbush, water, and headed out. 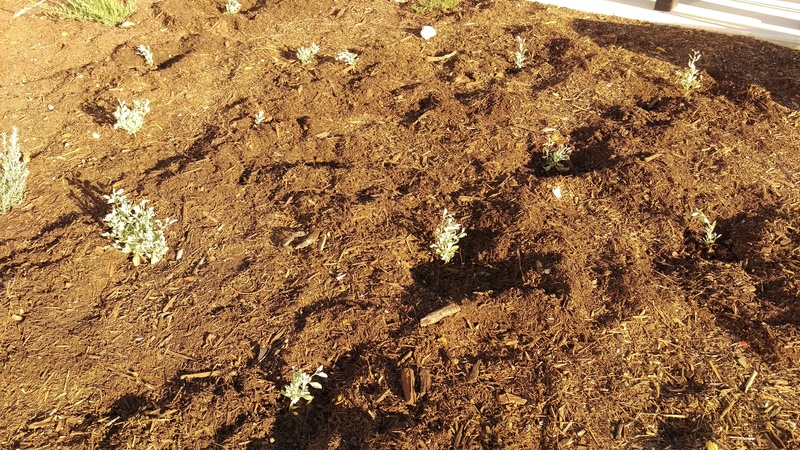 Baby seaberry saltbush went in in front of some I planted about a year ago. Thanks to the council for putting in a watering system, and connecting it to water (hence that brown pipe you can see)! And here is the fence! You can see the new ‘old man’ saltbush in the darker patches near top right. I have planted everything you can see growing in this patch. An elderly man leaning on a walker came past, doing what must feel like a marathon through the neighborhood to him. He congratulated me on my cleverness, bless him. With the summer weather, these plants are visibly growing despite the council not having connected the new watering system they put in here to any water source. Three cheers for the hardiness of native plants! That’s one heck if a Christmas present for your community. May the rain gods bless your plantings. Thanks, Leonie! Maybe it was your intercession with the rain gods that led to us having rain this morning after a massive heat wave? Thanks!!! Hopefully we’ll get some tonight. The clouds are building up. Creeping boobialla? Is that the plant I know as myoporum? Are you ever tempted to plant things that will give colour in a dye pot? That could be a win win win for the community, the environment, and you! Love your blog! Hi Margaret, yes, that is exactly the plant I mean. Thanks for your sweet comment! I am indeed tempted to plant dye plants. 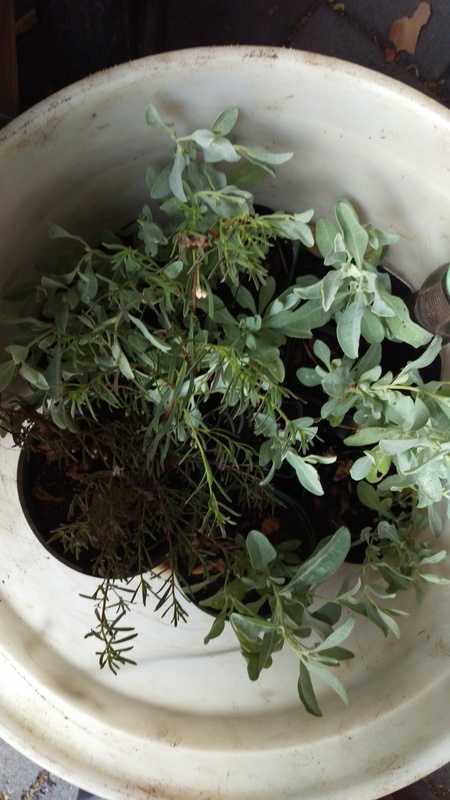 It’s just a question of finding some that could thrive through an Adelaide summer with no water… although now watering has gone in to two sites near home, maybe I could expand my horizons and plant indigofera autralis… mmmm! I am trying to grow my favourite dye eucalypts from seed at present and it is a big, slow project. But I think I am up for it! I have been watching your guerilla gardening adventures with interest but I realise I have missed some key details. Do you grow your plants from saved seed or cutting? In the parts of our front garden that are not mulched the hop bush and poas self seed. Do you always mulch the plantings?